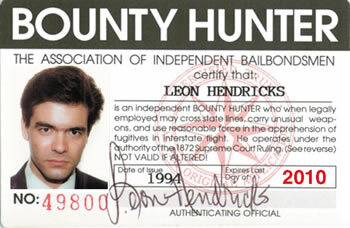 On the front of this three color, double sided Bounty Hunter ID card, there is room for a photo and a signature from the authenticating officer. With the written Decision of the U.S. Supreme Court ruling in the Taylor vs. Taintor case on the reverse side of this card, the front also certifies the cardholder and states that the above named: is an independent Bounty Hunter who, when legally employed, may cross state lines, carry unusual weapons and use reasonable force in the apprehension of fugitives in interstate flight. He operates under the authority of the Supreme Court Ruling (see reverse). NOT VALID IF ALTERED. 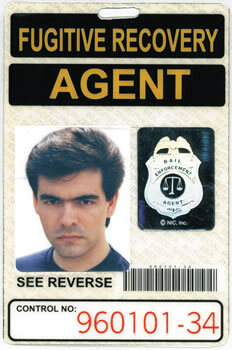 On the front of this two-color Surety Agent ID card, there is room for a photo, control number and a signature from an authorizing official. 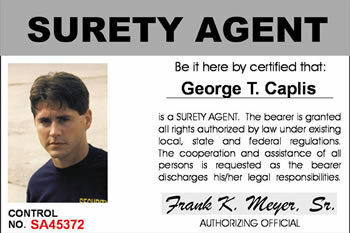 With nothing on the reverse side of this card, the front also certifies the cardholder and states the above named: is a Surety Agent. The bearer is granted all rights authorized by law under existing local, state and federal regulations. The cooperation and assistance of all person is requested as the bearer discharges his/her legal responsibilities. 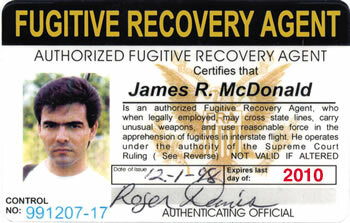 On the front of this three color, double sided Fugitive Recovery ID card, there is room for a photo and a signature from the authenticating official. With the written Decision of the U.S. Supreme Court ruling in the Taylor vs. Taintor case on the reverse side of this card, the front also certifies the cardholder and states that the above named: is an authorized Fugitive Recovery Agent, who when legally employed, may cross state lines, carry unusual weapons, and use reasonable force in the apprehension of fugitives in interstate flight. He operates under the authority of the Supreme Court Ruling (see reverse). NOT VALID IF ALTERED. 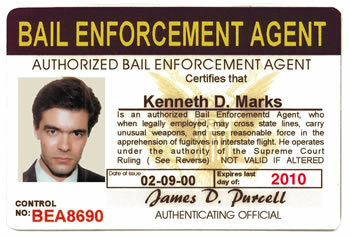 On the front of this three color, double sided Bail Enforcement Agent ID card, there is room for a photo and a signature from the authenticating official. With the written Decision of the U.S. Supreme Court ruling in the Taylor vs. Taintor case on the reverse side of this card, the front also certifies the cardholder and states that the above named: is an independent Bail Enforcement Agent who, when legally employed, may cross state lines, carry unusual weapons, and use reasonable force in the apprehension of fugitives in interstate flight. He operates under the authority of the Supreme Court Ruling (see reverse). NOT VALID IF ALTERED. 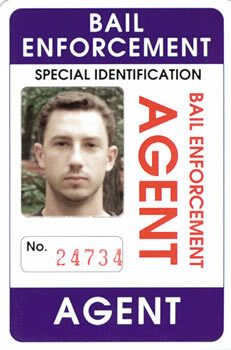 On the front of this three color, double sided Bail Enforcement Agent ID card (New Style), there is room for a photo and a signature from the authenticating official. 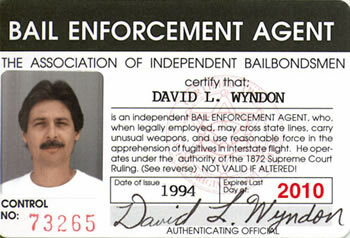 With the written Decision of the U.S. Supreme Court ruling in the Taylor vs. Taintor case on the reverse side of this card, the front also certifies the cardholder and states that the above named: is an authorized Bail Enforcement Agent who, when legally employed, may cross state lines, carry unusual weapons, and use reasonable force in the apprehension of fugitives in interstate flight. He operates under the authority of the Supreme Court Ruling (see reverse). NOT VALID IF ALTERED. 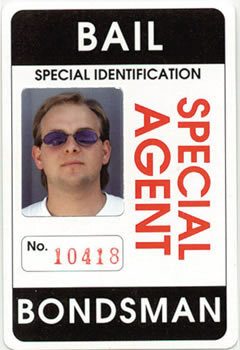 On the front of this three color, double sided Bail Bondsman Special Agent ID card, there is room for a photo and no. With designated locations for remaining personal information on the reverse side of this card, there is also certification of the cardholder: This identification card is issued for the private use of only the person identified above. This card is non-transferable and void if altered. It remains the property of the issuing company/agency and must be returned upon demand. On the front of this three color, double sided Bail Enforcement Agent No. 2 ID card, there is room for a photo and no. With designated locations for remaining personal information on the reverse side of this card, there is also certification of the cardholder: This identification card is issued for the private use of only the person identified above. This card is non-transferable and void if altered. It remains the property of the issuing company/agency and must be returned upon demand. This Fugitive Recovery ID Card kit is a kit you assemble yourself! It uses a Passport sized photo and comes with complete instructions, an A08 Pocket Clip, a Laminate, a Self Adhesive Foil Hologram and a Template to size the photo for authentic appearance. It also has Bright Yellow Letters on a Black Panel and a Shaded Yellow background and measures 4 1/2-inches X 3-inches (Folio size). 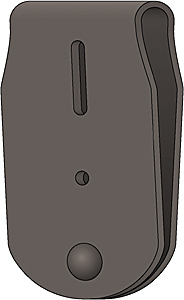 To Go With Your ID Card. These badge cases make great companion units for all of the standard eagle-topped oval-shaped badges above. 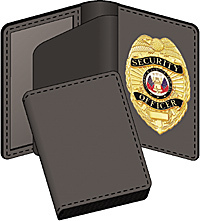 They feature a custom-shaped recessed badge holder section, a badge protector flap, and an ID display compartment. Color: black.